While the entire healthcare community, for decades, has been clamoring for, cajoling, and demanding integration of its IT systems, we're actually in a pretty elementary stage when it comes to useful, practical, health IT systems integration beyond on-premise and in-building hospital software. Our problem in the industry is not that engineers don't know how to create the right technology solutions or that somehow we have a big governance problem; while those are certainly issues in certain settings, the real cross-industry issue is much bigger - our approach to integration is decades old, opaque, and rewards closed systems. For decades, starting in the 50's through the mid 90's before the web / Internet came along, systems integration meant that every system had to know about each other in advance, decide on what data they would share, engage in governance meetings, have memoranda of understanding or contracts in place, etc. After the web came along, most of that was thrown out the window because the approach changed to one that said the owner of the data provides whatever they decide (e.g. through a web server) and whoever wants it will be provided secure access and they can come get it (e.g. through a browser or HTTP client). This kind of revolutionary approach in systems integration is what the health IT and medical device sectors are sorely lacking and something that ONC can help promote. We're more "push data" versus "pull data" focused than is warranted early in projects. We're more "heavyweight industry-specific formats" focused instead of "lightweight or micro formats" focused. Data emitted is not tagged using semantic markup so it's not shareable by default. Shahid N. Shah is an internationally recognized and influential government technology and healthcare IT thought leader and writer who is known as "The Healthcare IT Guy" across the Internet. He is a strategist for various federal agenices on IT matters and winner of Federal Computer Week's coveted "Fed 100" award given to IT experts that have made a big impact in the government. 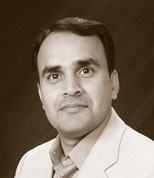 Shahid has architected and built multiple clinical solutions over his almost 20 year career. He helped design and deploy the American Red Cross's electronic health record solution across thousands of sites; he's built two web-based EMRs now in use by hundreds of physicians; he's designed large groupware and collaboration sites in use by thousands; and, as an ex-CTO for a billion dollar division of CardinalHealth he helped design advanced clinical interfaces for medical devices and hospitals. Shahid also serves as a senior technology strategy advisor to NIH's SBIR/STTR program helping small businesses commercialize their healthcare applications. Shahid runs three successful blogs. At shahid.shah.org he writes about architecture issues, at healthcareguy.com he provides valuable insights on how to apply technology in health care, at federalarchitect.com he advises senior federal technologists, and at hitsphere.com he gives a glimpse of the health-care IT blogosphere as an aggregator.